I don’t doubt for a moment that Ms. Crumb’s distress is very real, and that the death of an animal she may never have seen in person has hit her hard. I do have to ask why, however. We all grieved when his valiant fight was for naught, taking comfort in the fact that his medical saga will benefit future injured horses. Refusing to “let him go” smacks of deeper problems, or at the very least a good ol’ fashioned dramabomb. On Sunday, NBC will be airing a one-hour documentary called Barbaro: America’s Horse (not to be confused with the HBO documentary in the works). The compulsion to mark anniversaries this way is a perfect expression of what Pat Forde refers to as “drama-addicted America”. 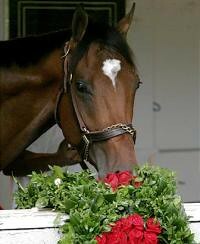 If you are still moved by Barbaro, if you really love horses, don’t send him a card. Don’t make another video pastiche for YouTube. Do something for all the other horses who don’t have the world on their side…If you really love horses, and not just because it’s cool to be sentimental over Barbaro, do something meaningful for all the horses who serve us, and suffer in silence, yet still trust humans to do the right thing. They deserve it just as much as any Kentucky Derby winner. I still stand by what I said. If you were and are genuinely moved by Barbaro, and love horses, then for God’s sake dry your eyes, pick up a shovel, grab your wallet and get moving. He’s dead and we can do no more for him. We can remember him, yes, but if he is to live up to his fans’ claims of greatness then those fans should be working on leaving him a more tangible legacy than a heap of tear-stained tissues on the grounds of Delaware Park. Update: Oh, all right. Here’s a slightly more sympathetic take from ESPN, The Church of Barbaro. Edgar Prado, who used the red-and-white leather saddle to guide Barbaro to a dominating victory in last year’s Derby, also used it while winning the 2002 and 2004 Belmont Stakes. The saddle will be auctioned off at the Mint Jubilee Gala on May 4, the night before this year’s Derby. Prado was aboard Barbaro during last year’s Preakness Stakes when the 3-year-old colt broke down in the front stretch after injuring his right hind leg. Prado’s ability to quickly pull up and calm the horse helped doctors immediately address Barbaro’s injuries. Barbaro underwent emergency surgery after the race and spent several months in rehabilitation before being euthanized in January following complications from the injury. If you can’t get down to Louisville for that, you can also support the charity with this. RIP Barbaro, originally uploaded by Cowtools. 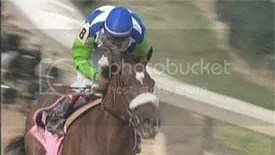 HBO Sports has begun production on a documentary that explores the triumph and tragedy of Barbaro. It will air June 6, three days before the Belmont Stakes (gr. I), at 10 p.m. Eastern and Pacific time. Tracing the colt’s significant accomplishments and setbacks, Barbaro, a “Sports of the 20th Century” documentary, will chronicle his medical treatment after the 2006 Preakness Stakes (gr. I) as well as the resolute character of his eternally optimistic owners and trainer. “The story of Barbaro is extraordinarily dramatic,” HBO Sports president Ross Greenburg said. “We will tell the complete story of his remarkable life journey. One year ago, he emerged at Churchill Downs as the best 3-year-old Thoroughbred with a genuine chance at greatness. Fourteen days later, on May 20, all that changed when he suffered the devastating leg injury at the Preakness. With the cooperation of Barbaro’s owners, Roy and Gretchen Jackson, Barbaro explores the many facets of the story, including the exceptional compassion displayed by trainer Michael Matz and the uncommon trust between Matz and the Jacksons. Barbaro captures his spectacular victory and promising future; the heartbreaking events two weeks later at Pimlico Race Course; and the challenging medical procedures used to try and save the horse’s life. Despite the odds, the Jacksons remained dedicated and never relinquished hope, with the medical expertise of Dean Richardson, DVM, Dipl. ACVS, at the New Bolton Center enabling Barbaro to survive in the wake of his accident. On Jan. 29, Barbaro’s valiant struggle came to an end when he was euthanatized. The executive producers of Barbaro are Ross Greenburg and Rick Bernstein; the producer is Margaret Grossi; and the story editor is Mary Carillo. It was written by Frank Deford, with original music composed by Brian Keane. 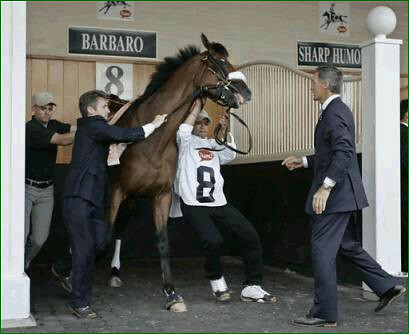 Barbaro Raring To Go, originally uploaded by seabiscuit schmiscuit. Delaware Park has announced that it has changed the $300,000 Grade Three Leonard Richards Stakes to the Barbaro Stakes in a tribute to the 2006 Kentucky Derby champion. The race on the turf at one and one-sixteenth miles for three-year olds will be run on July 15, the same day as the $1 million Delaware Handicap. Barbaro broke his maiden in a turf race at Delaware Park in 2005. He was euthanized in January after complications from catastrophic injuries in last May’s Preakness. 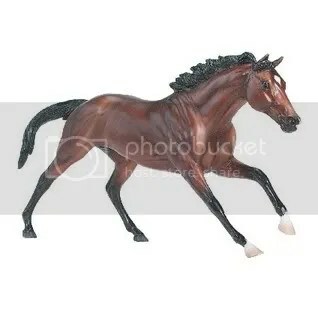 Bowing to phenomenal demand for the critter, which had only been available from October 1 2006 to January 1 2007, Breyer announced that it will be reissuing the Barbaro model. If you missed it last time, now’s your chance.